This is part three of a series on American history and the phenomenon of “fake news.” Read part one here and part two here. Misinterpretation of the ideas of two 18th century giants, John Adams, “The Atlas of American Independence,” and Adam Smith, “The Father of Capitalism,” has contributed to what is essentially an aristocracy in the United States. Both men left substantial bodies of published and unpublished works that contain suggestions to help us democratize. First, three core principles, justice, liberty and equality, must replace our primary contemporary principles of individual selfishness and greed. Adam Smith wrote that the establishment of justice, liberty, and equality “is the very simple secret which most effectually secures the highest degree of prosperity to all the three classes.” He used this formula explicitly twice and implicitly three times in Wealth of Nations. Well-known as a moral philosopher, Smith was deeply concerned with justice in both its juridical and ethical meanings. Adams, as a lawyer and the author of the Massachusetts Constitution, the longest continually in existence written constitution in the world, shared this concern. His opposition to slavery is an example of a moral/ethical component to his ideas about justice. Adams and Smith were strong advocates of liberty throughout their lives but not in the contemporary, individualistic sense. No one can deny the individuality of these men. But the importance they attached to community and sociability makes it clear that they did not advocate rugged individualism. Sociability is the foundation of Smith’s Theory of Moral Sentiments but it is also important in Wealth of Nations. It is implicit in John Adams’s public-spirited sacrifice of individual comfort and a thriving law practice to serve in the Continental Congress and as a diplomat in Europe. More significant, this service meant absence from his family for years at a stretch. To him, the public good trumped individual advantage. Both strongly believed in equality. Adams’s fear of aristocracy demonstrates his egalitarian political beliefs. He was not anti-aristocracy; he thought all classes had roles to play. Adams’s belief that all are created equal is clear in his April 22, 1761 letter to Samuel Quincy praising the creativity of butchers and hunters, equating them to great poets and major political leaders, such as Caesar. In that letter, he wrote that “genius is more common … than is generally thought” (Papers of John Adams, I, 1977, p. 50). Smith thought there were no fundamental differences among different classes and races of people. And he wrote that new industrial techniques could promote equality. He thought that the division of labor would make it possible for all classes to be wealthy. It is the great multiplication of the production of all the different arts, in consequence of the division of labour, which occasions, in a well-governed society, that universal opulence which extends itself to the lowest ranks of the people (Wealth of Nations). Note the insistence on a “well-governed society.” Adams would have agreed. 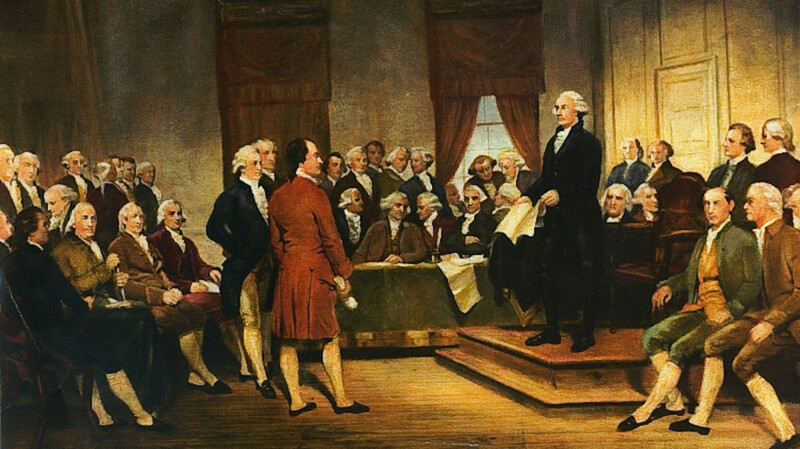 In addition to demanding justice, liberty, and equality, Adams and Smith share several other principles that may be applicable to the 21st century. A scientific, evidence-based approach characterizes the work of both men and would be an important antidote to the current flood of fake news. Both were social scientists, not natural scientists; their work was based on extensive research and careful reasoning. Both were critical of ideological arguments: Smith criticized the spirit of a system that valued theory above reality; Adams vociferously denounced factionalism. He wanted politics to be decided by carefully reasoned argument, not emotion and party spirit. Factionalism included ethnocentrism. Smith, a valued adviser to British governments, advocated adopting best practices found anywhere in the world. For instance, he wrote that if France had discovered a highly productive agricultural innovation, Britain should not begrudge them their good fortune—Britain should adapt it. (That France’s agriculture was quite backward in Smith’s time may indicate that he was making this point humorously, rather than advocating a specific French agricultural policy.) Adams moved, during his lifetime, from Massachusetts particularism to a surprising openness by the end of his life (Public Humanist, March 25, 2010). Both emphasized the importance of education. Smith, while appreciating the potential of the division of labor to spread opulence to the lowest ranks of the people, was concerned that the repetitive nature of modern industrial work would dumb down the working class so much that workers would be unable to fulfill their responsibilities as parents, citizens, or soldiers. 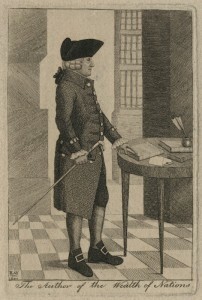 Thus he argued that government should be responsible for educating the working class. 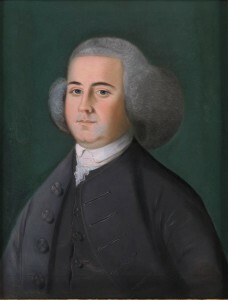 Adams also emphasized education, writing in Thoughts on Government: “LAWS for the liberal education of youth, especially of the lower class of people, are so extremely wise and useful, that to a humane and generous mind, no expense for this purpose would be thought extravagant” (Papers of John Adams, IV, 1979, p. 91). In the Massachusetts Constitution, he included a significant role for government in education, and was thrilled when it was ratified by the voters. The importance of responsibility, both of individuals and of governments, is clear in their writing. Smith was acerbic in his criticism of British government funding schemes for useless wars. He was similarly critical of individual irresponsibility on the part of the poor (for buying luxuries like tea and chocolate) and the wealthy (referring to silver and gold plate as “trifling superfluities”). Adams regularly commented in his letters from Europe about difficulties stemming from individual states not meeting their Confederation responsibilities. He was critical of individual businessmen profiteering off the Revolutionary War; a responsible citizen should work for the common good, not strive for individual riches. Similarly, he criticized irresponsibility of ordinary people. Both supported progressive taxes as just and responsible government policy. Is there any evidence that the combination of principles Smith and Adams advocated would work? Indeed there is, right here in the United States. In the immediate post-World War II period, we had a relatively egalitarian political economy. There was bipartisan support for a massive infrastructure project (the Interstate Highway system), bipartisan legislation attacking racial inequality, and the GI Bill of Rights, which democratized higher education and expanded home ownership. Taxes were steeply progressive, providing resources for government programs. Economic gains from increased productivity were shared widely so all three classes advanced at similar rates. But this ended in the 1980s. Since then gains from productivity have gone, predominantly, to the wealthy. In addition, the top income tax rates were radically reduced, making those rates significantly less progressive; these reductions, along with monopolization of productivity gains, have radically increased the concentration of wealth. As a result, the wealthy have steadily pulled away from the rest of the country while the other classes have stagnated, barely treading water. In the United States and many other countries individual liberty has been emphasized at the expense of the equally important justice and equality elements in Smith’s simple secret for wealthy nations. Distortion of his formula dating back to the 19th century has led to immense wealth and power for a few, at the expense of the many. This is not the economy Smith advocated; nor is it the democratic republic that Adams envisioned. But we may be able to use their works to help us move forward. Wonderful blog post John. Thank you! Thought-provoking series of blog posts. I especially appreciate the excellent point about Smith’s and Adams’ aversions to ideological arguments and “theory above reality.” As you rightly point out, Smith’s “invisible hand” was removed from its context and set into an alternative ideological construction. Now on the political right and left we emotionally debate that ideology rather than the original ideas that actually represent a different way of thinking altogether. I am neither a political scientist nor an economist but it is not difficult to see the complete rationality of the thinking in this blog, to see the value of the thinking of Smith and Adams. America is in the state it’s in because of self-centeredness and greed. When at last politicians are going to understand that their very name means they work for the people, not for their own power and position; when at last the 1% learn they are no more entitled to their wealth than anyone else and that any wealth carries with it responsibility for the have-nots; when business learns the bottom line is not the all-important factor, but dependability and fairness are; when at last the rest of us learn to live responsibly by not wasting resources, by being willing to pay the taxes that will keep the infrastructure safe; when at last we all learn that what hurts someone else also hurts us and what is good for us is also good for others–then at last we can experience a happy and contented nation.